When I saw the Google in Education Summit come up in my feeds a few months ago, I thought that it would be a good opportunity to reinvigorate the implementation of Google Apps in my school. Having had a bit of history with Google Drive, the implementation process has come to a bit of a stalemate. I’ve got to a point where everything is set up, raring to go, but nothing was being used. The second keynote was from +Jim Sill, a Google Apps Certified Trainer from America, who spoke about creativity. He illustrated all the ways in which people create digitally these days – vine, instagram, twitter, youtube – and encouraged people to “slap a sadle on it and ride it”. He also warned that if you do not allow students an avenue for creativity in today’s day and age there are stark consequences. The third keynote ended the summit and was from +Chris Betcher. Short, but sweet, Chris provided a snapshot of the world fifteen years ago when Google started and where technology has come to now. He suggested that the things that we are able to do now, we could do then, but with the development of the web, we are able to do them now without friction and stress. In addition to the keynotes, one of the anomalies of the Google in Education Summit was the Demo Slam. A little like the speed sharing sessions at the ICTEV conferences, except competitive, presenters are given three minutes to wow the audience in order to get bragging rights. Some of the ideas thrown out there was using a formula in Spreadsheet to translate, using Google Docs Story Builder to … build a story and a Chrome extension, Too Long Don’t Read, to summarise various webpages. All in all, it was a great way to end the first day of the summit. The rest of the time was made up of various presentations. Although there was a wide range on offer, I chose not to go to some of the more complicated sessions revolving around scripting and supercharging chrome, instead I focused on trying to best utilise the basic set of Apps provided through Google Apps for Education. I also realised quite early on that there were so many resources bouncing around that even if I missed out on a session, there was still plenty of information that I could go to later if I wished (see for example Chris Betcher’s fantastic collection of resources at http://www.summitstuff.com/). In another set of sessions I looked at Google Sites. I had personally looked into Sites in the past, but really didn’t know where to start. The first session I went to was run by Chris Betcher and looked at how to create a Site from scratch, while the second session was by +Anthony Speranza and explored the potential of using Sites to create ePortfolios. The two things I came away with in regards to Sites was that it is actually easier to start from scratch rather than use the different templates, while it is also really important to have a clear purpose as to what you are trying to create and why. Lastly, I went to few sessions exploring the implementation of Google Apps for Education. Although we have already gone through the various steps involved in setting it up, I was hoping to get a few ideas on how to improve things. Again, like Sites, I went to a mixture of sessions, one by +Mike Reading which went through the intricacies involved in setting everything up, posing some great questions to consider along the way. The second presentation was by +Corrie Barclay who gave a bit of an overview of the practical ways in which Google is used at his school. Connecting and collaborating. It is always great to learn with a whole bunch of new people. New ideas. Whether it be improving search capabilities or using Google to build a site, there were so many new and exciting ideas to share back at school. Meeting people for real. It may seem silly, but it is actually good to meet those people I connect with online in person. Finding a Seat. Yarra Valley Grammar School was a great venue, but the idea of simply turning up to the session that you wanted to go to led to some pretty cramped presentations. 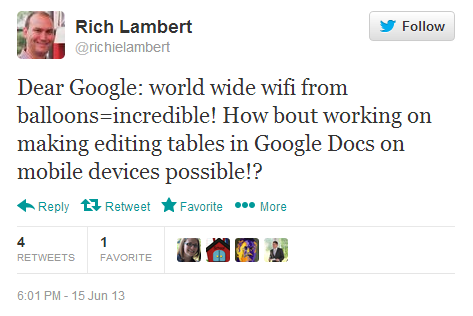 Google Sites. Whether it be a portfolio or an assignment, I think that Google Sites has a lot of potential sharing to the world. Improving Search Skills. I think that this is something that is both simply, but really powerful and has an impact on everyone. Developing a Vision. For GAFE to go anywhere in the school, there needs to be a clearer set of goals as to what we wish to get out it. A part of this is spreading the load, getting more people on board. I would love your thoughts and reflections in the comments below if you were also there or have introduced Google Apps for Education in your school. Put a Saddle on It and Ride It – Melbourne Google in EducationSummit2013 by Aaron Davis is licensed under a Creative Commons Attribution-ShareAlike 4.0 International License.